75 ohm male BNC Video, male 2.1mm DC power on attached cable, female RJ45 connector. 75 ohm male BNC Video on attached cable, female 2.1mm DC power on attached cable, female RJ45 connector. 75 ohm male BNC Video, male RCA on attached cable, male 2.1mm DC power on attached cable, female RJ45 connector. 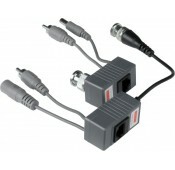 75 ohm male BNC Video on attached cable, male RCA on attached cable, female 2.1mm DC power on attached cable, female RJ45 connector. WxDxH (in. ): 0.9x1.7x1.5 (excluding attached cables).